Are you familiar with the expression "geo-tarding". It comes from "geo-targeting" and expresses the world's annoyance with poorly geo-targeted videos and other content. One big reason for geo-tarding is global licensing deals. It's sometimes the case that media platform X has the rights to show and advertise a program in one terrirority, wants to release some videos to promote it but doesn't have the rights to show the program in another territory and so geo-tards. Here's an example, the new Torchwood series (a Doctor Who spin-off) is a team effort between US' Starz and the UK's BBC. This trailer looks like it might be a kick off for a mini viral campaign for the show. 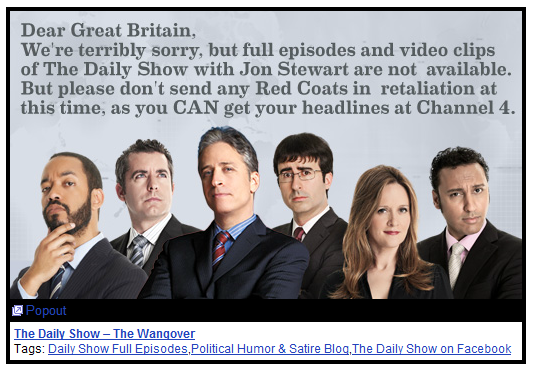 Except, you can't watch it in the UK. I'm told the video asks us to search for [Esther Drummond]. The current top position (for me) is this IMDB link. Also in the top results I get this video link. The geo-tarding is pointless. One of my favourite TV shows suffers from geo-tarding problems. Here in the UK we don't get to watch all of Jon Stewart's The Daily Show. The licensing structure means that all officials go out with geo-tarding.